One of the most depressing things about the last year, for women, has been to realize that no matter how far a woman climbs in her career, she will never command the same amount of respect as a man. We saw it when Hillary Clinton lost to an old guy who doesn’t have a brain, again when Elizabeth Warren was silenced by a guy who doesn’t have a neck, and yet again when reporter April Ryan was told to “stop shaking your head” by a guy who doesn’t have a heartbeat. So maybe it’s not totally surprising to learn that the former and current female justices on the Supreme Court—yes, all four of them (out of 112 total justices)—aren’t treated with the same respect and authority as their male counterparts. Using a variety of statistical techniques, we find that even though female Justices speak less often and use fewer words than male Justices, they are nonetheless interrupted during oral argument at a significantly higher rate. Men interrupt more than women, and they particularly interrupt women more than they interrupt men. This effect is not limited to the male Justices: the male advocates also regularly interrupt the female Justices. This is surprising, both because the Court’s guidelines explicitly prohibit advocates from interrupting Justices, and because the Chief Justice is supposed to intervene when this occurs. We found a consistently gendered pattern: In 1990, with one woman on the court (Justice Sandra Day O’Connor), 35.7 percent of interruptions were directed at her; in 2002, 45.3 percent were directed at the two female justices; in 2015, 65.9 percent of all interruptions on the court were directed at the three women on the bench. In the 2015 term, when there were twice as many men on the court as women, Sotomayor, Kagan, and Ginsburg were each interrupted more than 10 times by their male colleagues—but only two male justices were interrupted more than 10 times. The most any woman interrupted a male justice was seven times. If you’re wondering if this has more to do with seniority than gender, the answer is: No, it doesn’t. Gender has an impact about 30 times greater than a justice’s seniority. As the Harvard Business Review has pointed out, this is a well-documented phenomenon. Multiple studies have found that women are interrupted more frequently than men, and that assertive women are judged more negatively than men who voice strong opinions and ideas. In the Supreme Court, that bias manifests itself by rendering a female justice’s oral arguments less important than a man’s. So what is the solution? Women get around it (at least partially) by learning how to speak more dominantly. 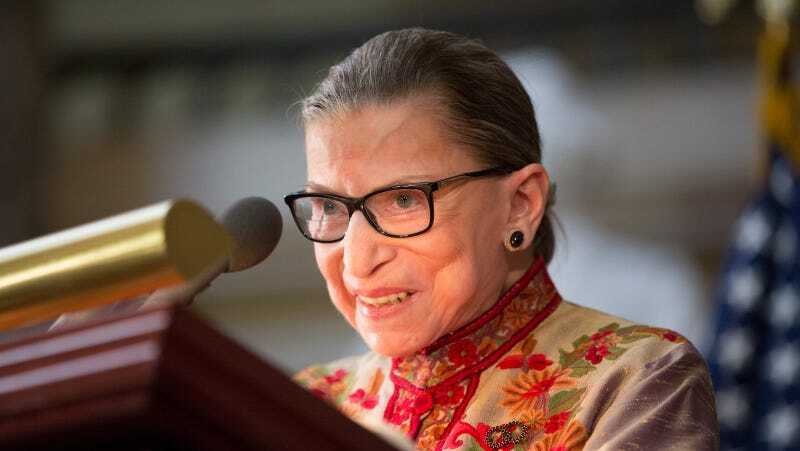 Senior justices like Ginsburg have learned to stop saying things like, “May I ask” and “Can I ask” and go ahead and then say what they want to say. The real solution, though, is for men to learn to stop being so in love with the sounds of their own voices.